Stefano is an Italian marine biologist fascinated by ecology and anthropogenic and natural effects on marine organisms. During his B.Sc he was involved in the Prometeus project aimed at monitoring cetaceans in the Tyrrhenian sea. During his M.Sc he worked under the supervision of Prof. Regoli at the laboratory of ecotoxicology of DISVA (Univpm) and analysed the effects of crude oil on Mytilus galloprovincialis at both chemical and biological level. He also spent 4 months at the University of Plymouth (UK) working on the effects of marine acidification on plankton under the supervision of Prof. Hall-Spencer, where he increased his ability in plankton identification, particularly pelagic and demersal copepods. 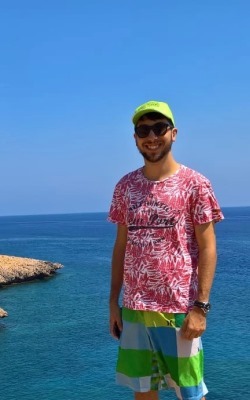 After he successfully earned the M.Sc degree, thanks to a fellowship awarded by the Univpm, he moved to Cyprus and worked 6 months at MER Lab where he has been involved in all on-going activities. He participated in field surveys that were focused on biodiversity assessments, video transect, sediment, water collection and more. The work lab involved macrofauna sorting, macroscopic species identification, sediment organic matter determination, granulometry, and more. He processed data and contributed to baseline and research reports. The internship at MER increased his ability in both lab and fieldwork, improved his teamwork and management skills and allowed him to work closely with a multi-national team of researchers and renowned experts, such as, Dr Teresa Alcoverro and Dr Marbà Nuria, during surveys conducted on Posidonia oceanica meadows of Cyprus.